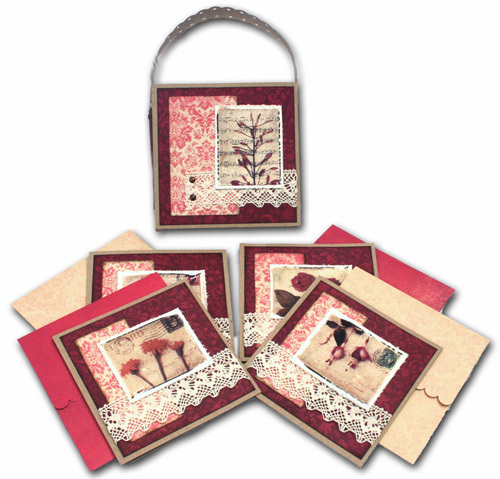 My Creative Existence: Art de Fleur Gift Card and Bag Set. The basic idea was from a tutorial at Spiltcoast Stampers, but I changed the dimensions of my project so I could have 4x4" gift cards, and I added matching envelopes. You can see more photos, and details about how I made this set, on the Darkroom Door blog here. If you are interested in attending any of my classes, check out the class schedules at Erina Scrapbook Store here. I'd love to see you there! These are really beautiful Sarah! I enjoyed your classes last Saturday and I look forward to the next one!